Facebook has decided to revise its privacy settings with articles published to "friends" by default. This update is intended for both newcomers to regular users. Privacy settings of Facebook will soon be reviewed. These new measures will allow new and old users, to better control their publications. 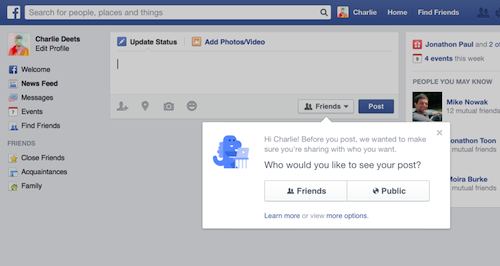 Thus, the visibility of default status applies only to "friends" of the user. A way for the social network of calm " users fears about the accidental sharing, or with the wrong audience of their status." In addition, there are two new tools. A reminder will alert users that their post is displayed for the public and they can switch to a smaller audience ("friends", "friends of friends"). On iOS, the sharing option is now highlighted, since it is found in letters displayed at the top of the interface. The web version will also be provided with a "selector public" clearer. As for Android and Windows Phone, Facebook ads work on improvements, without giving details. "New users will be reminded to choose an audience for their first publication. If they ever overlook this choice, the publication will default to "friends". "Said the announcement in the press of the social network space. "For people who already use Facebook, we will start rolling out new privacy settings, which will in a few steps to better control the visibility of their publications, their applications and elements of privacy to their profile." Since the establishment of an Anonymous Login, Facebook continues to strengthen the guarantees of privacy and respect the privacy of its users.